Back by popular demand! The “Northwoods Notebooks” which we made over two years ago at a program meeting of NBG! This handy, one-of-a-kind notebook is perfect for holding NBG meeting and workshop notes, tracking progress on your New Year’s resolutions, sketching ideas for future projects, or collaging artful papers and images. The notebooks, with pages measuring 7.25 x 4.5″, will be bound with 1-inch spiral coils. 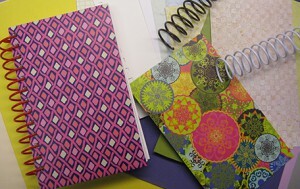 A variety of decorative and repurposed papers will be provided to use as notebook pages, and you can personalize your notebook with some of your own, if you like. You are encouraged to bring material for your front and back covers – decorated file folders, painted (or plain) watercolor paper, or any heavy cardstock. We will have some recycled colored folders available for you to use for covers, if needed. We will cut them to size and punch the covers’ holes at the meeting. Everyone welcome! We look forward to seeing you at the meeting!